GARDEN PARTY MASSACRE wins "Outstanding Horror/Comedy" at Zedfest Film Festival! HOLLYWOOD, Calif. - Nov. 4, 2017 - PRLog -- Gregory Blair's crowd-pleasing brew of murder, mirth and mayhem GARDEN PARTY MASSACRE collected another accolade last night at the 8th Annual Zedfest Film Festival: "Outstanding Horror/Comedy". The Festival, founded in 2010 by Wendy Medrano and Ed Stephens, honors filmmakers who persevere against all odds to get their films made and who embody the spirit of passionate movie making. Blair's film, a winking valentine to the genre, bursts with that passion. This is the ninth award for the film to date. "I'm thrilled to have the film honored by judges and critics," Blair said. "But the big thrill is that audiences are loving the film. Comedy is tricky; you never know if what you're putting out there is going to resonate. But hearing the laughter and cheering at each screening lets me know we succeeded—at least to some degree. You can't ask much more than that." 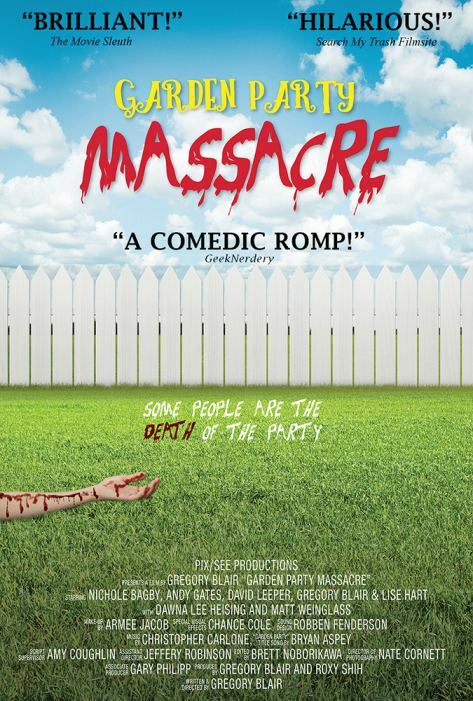 GARDEN PARTY MASSACRE has already won eight awards including two Los Angeles Academy of Film Awards ("Outstanding Horror/Comedy Feature" and "Outstanding Ensemble"), a Hollywood Independent Filmmaker Award for "Narrative Feature: Comedy", "Best Comedy" from the Artists and Aliens Film Festival and "Best Film" from the Lucky Strike Film Festival as well as "Best Feature", Best Actress" (Nichole Bagby) and Best Editing" from the FANtastic Horror Film Festival. The film--Blair's follow-up to his award-winning DEADLY REVISIONS--is a fast-paced, wacky romp in the vein of Shaun of the Dead and Tucker and Dale vs. Evil involving a friendly backyard gathering that goes hilariously awry when an unexpected guest arrives. With a pickaxe. And an attitude. It's a madcap mix screwball comedy and slasher tropes that critics have hailed "Hilarious! ", "Brilliant!" and "A Comedic Romp!" (Search My Trash Filmsite, The Movie Sleuth and Geek Nerdery, respectively).